How much does a global education cost, and why? The costs involved in your child's education, and why they are rising every year. As a parent, there would be a few questions you’re likely to ask - why, what (stream), when (UG/Grad/PG) where, and how much. Our previous post focuses on the first few questions, and this one, on the last. An education abroad doesn’t come cheap. Most parents we have interacted with have been surprised by the costs involved. So, how much does it cost to send your children abroad to study? Depending on the university, undergrad college education can cost about $30,000 – $55,000 per year. (refer table below) In addition, there will be some other incidental expenses bringing the total to $45,000-$75,000 per year. Even at $60,000, that’s a total of approximately Rs. 43 lakhs per year. This means that the total cost of an undergraduate education can be around 1.9 crores. Obviously, there are countries where education costs are lower, but by Indian standards they are all quite expensive. 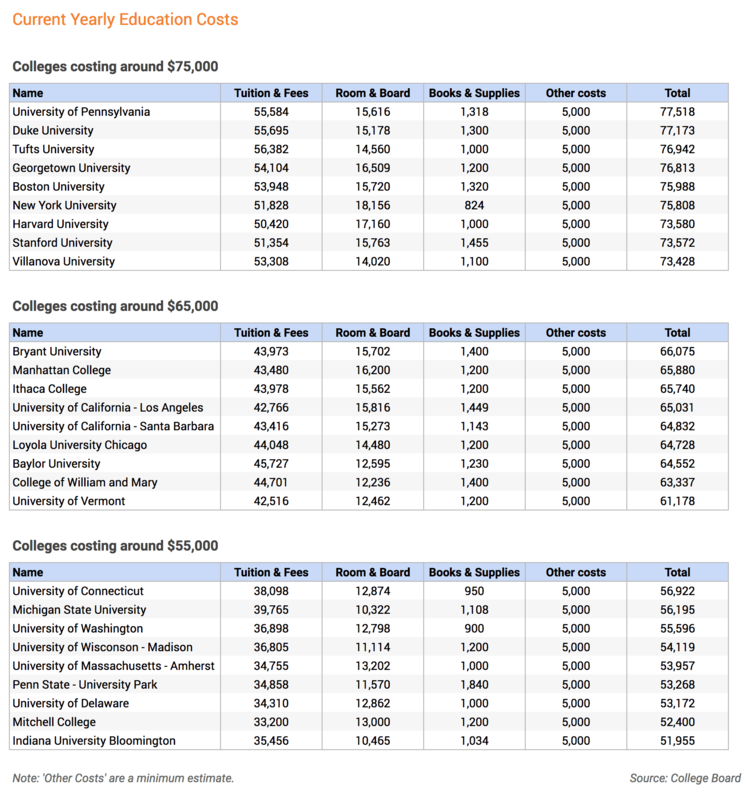 Many universities have financial assistance programs which offer scholarships for deserving candidates, but there is a lot of competition, and only a small minority benefit from scholarships. What are the main factors affecting these costs? The first is rising costs. That doesn’t happen just in India, it happens in the US too. Inflation in the US is at around 2-3%. This needs to be factored in when calculating the cost of your child’s education 5/10/15 years from now. Secondly, the fact that you will be saving in rupees, and your child’s education expenses will be in dollars, adds an element of uncertainty - exchange rate fluctuation. i.e. 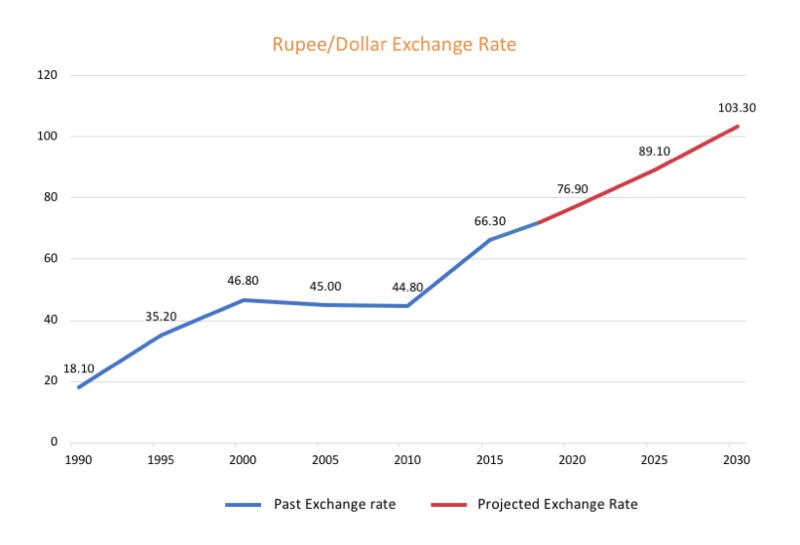 Today, the rupee is at 72 against the dollar, in 2010, it was 45 (graph below); what would be the rate 5/10 years from now? We estimate the rupee to depreciate by about 3% annually against the USD in the next decade. What all this means is that the costs already high, and continue to rise. But the good news is that an education abroad is still achievable - we can help personalise a plan for you. You can read all about it here. Home › Finance Blog › How much does a global education cost, and why?